Prof. Jennifer Henderlong Corpus [psych] was named Oregon Professor of the Year by the Carnegie Foundation for the Advancement of Teaching. 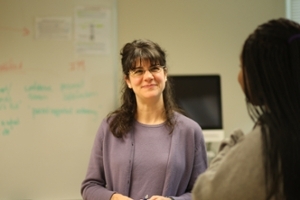 Prof. Jennifer Henderlong Corpus [psychology 2001-] was named 2014 Oregon Professor of the Year last week by the Carnegie Foundation for the Advancement of Teaching in recognition of her innovative approach to teaching and learning and her ability to challenge students beyond the classroom. Judges selected the national and state winners based on four criteria: impact on and involvement with undergraduate students; scholarly approach to teaching and learning; contributions to undergraduate education in the institution, community, and profession; and support from colleagues and current and former students. Prof. Corpus is an expert on the field of motivation and has conducted extensive research into the role of praise, which can function as a reward with both positive and negative consequences.